Since Beckett Fogg and Piotrek Panszczyk launched their line, aptly dubbed Area, everyone from Bella Hadid to Rihanna has sported the signature (beyond!) 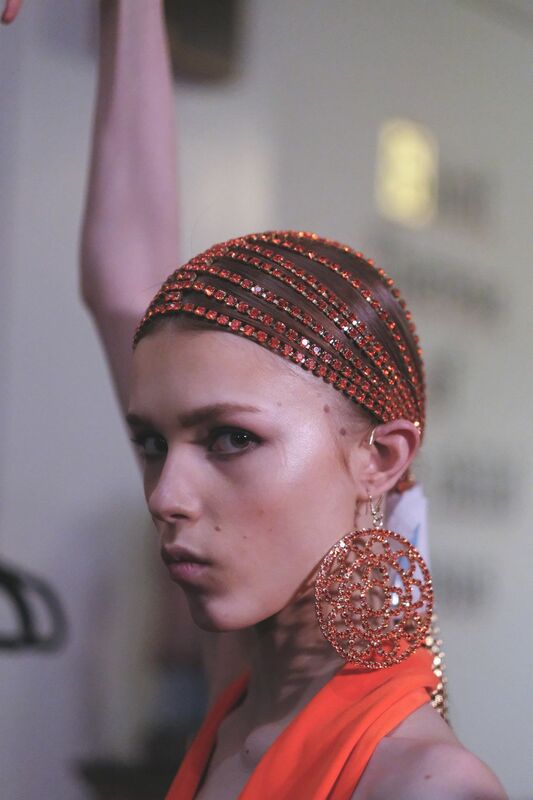 oversized earrings, glittery tube tops and lucite accessories. The downtown NYC brand has a sort of untouchable, maximalist cool girl aesthetic. This time around, Area presented another covetable collection filled with all things shiny — crystal face masks, even — at an Art Deco palm tree filled atrium downtown. Here's everything else you need to know about the fall 2019 show. Hidden in all the distinctly different looks and references in Area's fall 2019 show was a subtle nod to couture from the 1960s. Chain link crystal was reinvented — strung through models' hair — and oversized houndstooth print was blown up and printed on little bodysuits and bodycon dresses. The color palette, too, was decidedly '60s-inspired. For the first time, we saw a really strong assortment of knits from the line. But obviously in the hands of Area, everything was a little bit over the top. There was plenty of sweater fringe, even dripping from chunky cable knit numbers. Towards the end of the snow, Area capitalized on the iridescent fabrics by which fans know it best. Deep purple and pink dresses and low-slung pants were styled with chunky faux fur boots and coats — like those worn during the raver heydays. A chain belt made out or CD-ROM material and shaped into the words, "Apocalypse Now" also punctuated the collection. Shibori, a Japanese form of tie dye, was the unexpected print of the season. 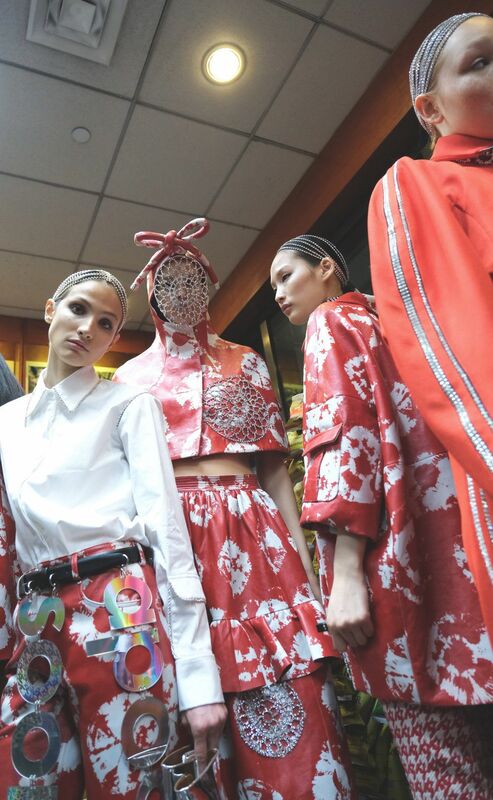 Whether in red and white iterations or printed on the raver looks, it added an element of radical craftiness. Some of the most stunning pieces were the crystal looks inspired by traditional crochet techniques. A rainbow crystal poncho and dress worn under a cobalt blue blazer closed the show. Crystal chainlink crochet was also woven throughout the collection in the form of masks, fringe details, apron-like dress coverings and embellished into sweaters.